Barefoot in a cotton dress, the seventh generation of Kneeland's Lone Star Ranch greets me at the farmhouse door. Named after her great-great-grandmother, 3-year-old Ora Sizemore's family has lived and worked on this land since the mid-1800s. The journey east to Lone Star Ranch from Eureka takes more than an hour on rough and twisty roads. Rising out of the coastal redwoods, the land softens and the air warms. Careening through vivid green fields, over cattle grids and across gravel switchbacks, I encounter no other cars. I do, however, dodge ranch dogs sleeping in the road and young calves that bound alongside the car. "You found us!" Ora's grandmother Dina Moore welcomes me into her kitchen. She puts on a pot of coffee and chats away like an old friend. She says the open range ranch comprises 6,000 acres and is home to 250 to 300 cows, depending on drought conditions. Dina explains they are a "cow calf operation," meaning they don't "finish" the cows up on the ranch. Instead, the calves are sold at auction. Like most ranches in Humboldt County, Lone Star is also sustained by timber harvest. A third component of the working ranch is the heavy equipment business, which comes into play during timber harvest and restoration work. The land is carefully managed with future generations in mind and everyone in the family has a role to play. This includes the animals. "The dogs are absolutely critical," says Dina. In the field next to the house, three "guardian dogs" lounge uphill from the meat goats. It's their job to look after the goats, and the goats' job to eat the invasive Himalayan blackberry bushes. "She was always cooking," remembers Dina's daughter Lauren Sizemore. Sizemore is nursing Ora's baby brother Ryden in an armchair near the wood stove. She is the executive director of the the Buckeye Conservancy and president of the Humboldt County Cattlewomen's Association. "My mother-in-law was probably one of the best cooks I've ever met," Dina declares. "Her buttermilk biscuits were just a tradition. She had a library of cookbooks. Hundreds .... From floor to ceiling." Dina's husband Mark Moore appears in the kitchen and quietly rummages around in the fridge. He's been out with a crew mending fences all morning. A man of few words, he says Edra's Parmesan chicken is his favorite and takes off with a cooler full of beef to trade with a neighbor. Collaboration is integral to a sustainable ranch lifestyle. The Moores are deeply involved in Humboldt County's ranching community. They work on a local, regional and national level to protect wide-open spaces and sustain their cultural legacy through mindful land stewardship. Together with children Jake, Teal and Lauren Sizemore, the Moores have worked with and served on boards for a dizzying number of organizations, Northcoast Regional Land Trust and Humboldt County Resource Conservation District among them. Mark and Dina are also founding members of the Yager Van Duzen Environmental Stewards, working to restore ranch roads and diminish sediment in the Van Duzen watershed. In fact, Mark and Dina recently won the 2016 Excellence in Range Management Award, an international honor recognizing their innovation, civic engagement and environmental stewardship. She makes copies of Edra's recipes and walks me outside where elderly fruit trees, evidence of homesteaders from long ago, blossom in the sun. We go to a few of her favorite spots to check out the views. Dina says she recognizes how fortunate she and Mark are that their next generation wants to be there. "We so value that," she says, looking out over the landscape. "We're grateful." Score the steak diagonally in both directions for diamond pattern on both sides. Pound the meat to flatten it a bit. Sprinkle it with garlic salt and pepper. Pre-cook the bacon until just done but not crisp. 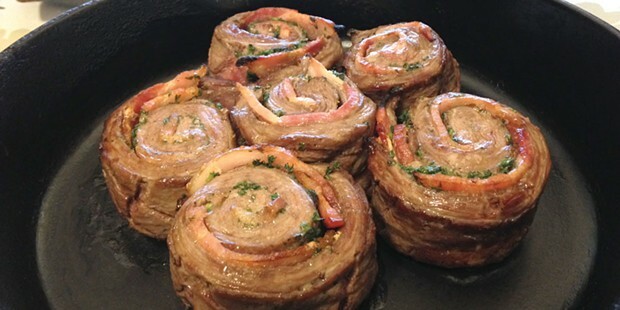 Place the bacon slices lengthwise on the steak and sprinkle it with parsley. Roll the meat up jelly-roll style, starting from the narrow end. Secure with wooden picks. Cut the roll into 1-inch slices. 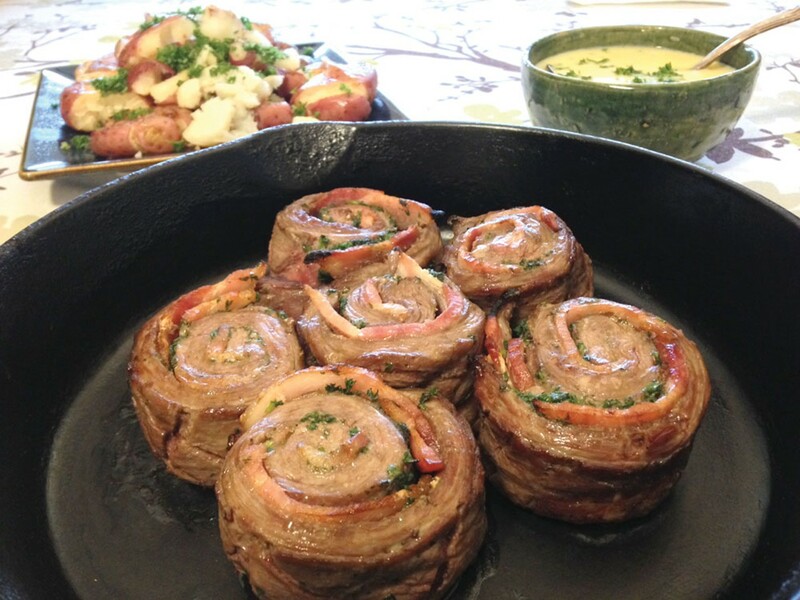 Place them in a baking pan and broil the sliced rolls to medium rare, 3-4 minutes per side, turning once. Prepare the hollandaise sauce according to package directions, adding the crushed tarragon to the dry ingredients. Serve the sauce over the rolls. Heat the oven to 450 F. Sift the flour, baking powder, salt and baking soda in a bowl. Cut in the shortening or butter with a pastry blender until the mixture is crumbly. Stir in the buttermilk to moisten all the ingredients. Knead the dough gently on a lightly floured board for about 30 seconds. Roll the dough out to ½-inch thickness and cut out biscuits. (A floured glass will work if you don't have a circle cutter.) Bake them on a lightly oiled cookie sheet for about 12 minutes. Serve warm. Rub the chicken pieces with lemon juice, paprika and salt. Place them skin-side down in a pan with oil and fry slowly over medium heat for about 20 minutes. Once the juice runs clear when pierced with a knife, arrange the pieces in an ovenproof dish. Heat the butter in a pan and sauté the mushrooms and mint 1-2 minutes. Blend in the cream and tomato. Bring the sauce to a boil, then remove the pan from heat and beat in the egg yolks. Add salt and pepper to taste. Pour the sauce over the cooked chicken and sprinkle it with the Parmesan. Broil the chicken and sauce until golden brown.